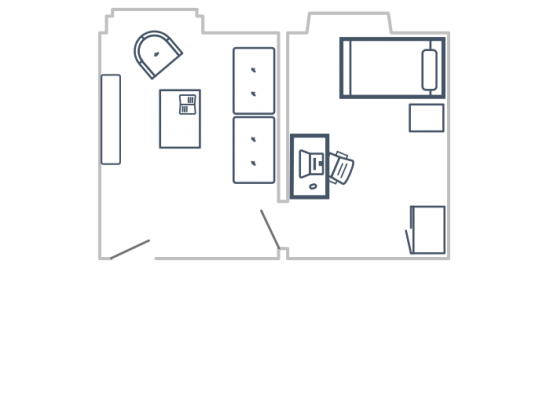 Our Premium studio is an all in one option, it includes a private room, living room and bathroom. It is perfect for those who want their own private spaces. Availability is limited, so be quick! You can book now. Nine is composed of flats with 5 rooms each. For each flat there is a kitchen and dining area open 24h a day where you can cook, drink or just relax with a friend. We value your sleep, we want you to rest and be comfortable. All our beds are Queen Size beds, designed especially for you to have plenty space to sleep. All rooms come with a generous study desk, a spacious wardrobe, designed shelves and a combination of modern lighting and decoration. We offer you the opportunity to choose the payment method that best fits your needs. Once you move in we require you to pay a refundable deposit of €400 euros upon your checkout if conditions are the same as when you checked in, plus a non refundable registration fee of €40 euros to cover legal taxes. Pay everything once you move in.